As I’ve played the new WoW expansion this week and journeyed through the lands of Pandaria I’ve been struck by two seemingly contradictory facts: Blizzard has crafted the best expansion for World of Warcraft yet, and if I didn’t have a ton of friends playing the game I would likely never open up WoW again. A lot of the coverage of Mists of Pandaria has implied that WoW has finally lost whatever ineffable quality made it the MMO juggernaut, but that’s both too mean to Mists and too kind to WoW in general. Objectively speaking it’s hard to argue that Mists isn’t the best expansion World of Warcraft has ever seen; there’s more features here executed more deftly than anything we’ve seen before. The storytelling is a vast improvement over the last expansion, Cataclysm. Leveling, raiding and just adventuring in general have been retuned to provide something to do at nearly every skill level and point of progression. The new Monk class and Pandaren race are both great additions to the game, but it’s hard to escape the conclusion that WoW has entered a point in its lifecycle where big advancements involve from smoothing off the rough edges instead of shaking up the game. To me the quintesential WoW improvement in Mists is multi-mob looting. Now when you gather up several enemies at once and take them all out, you can click once to loot all the mobs in the nearby area instead of clicking on each of them individually. It’s a quality of play improvement so obvious that the moment you have it you wonder how MMO games have ever done without it, but it doesn’t actually change anything about the game; it just makes it a little more pleasant. That’s Mists in a nutshell: WoW is better than ever, but it’s still the same old grind. It’s odd to criticize a great game for being better than it was before, but it’s probably a criticism Blizzard is used to by now. Both Starcraft II and Diablo III were hailed as improvements on their predescesors that were still criticized for not really bringing anything new to the table. Having made the definitive RTS in Starcraft, the definitive dungeon crawler in Diablo and the definitive MMO in WoW, Blizzard doesn’t seem all that interested in straying from conventional success these days. To be fair, Blizzard’s forte has always been refining ideas. They didn’t invent any of the genres of their major franchises; they simply streamlined them into the best quality games they could make, games that would become the yardstick all other games in that genre are judged by. The problem is that the pressure to be the next Diablo or the next Starcraft forced other developers to think outside the box. If you can’t make a better traditional MMO than WoW (and with the game’s massive player base and eight years of streamlining it’s pretty easy to argue that you can’t) then you have to ask why you’re making a traditional MMO at all. Even a year ago it was a safe strategy for Blizzard to keep doing what it did best. WoW lost some subscribers during the last expansion, Cataclysm, but it was still by far the most successful subscription MMO on the market. That seems less like a safe bet with this new expansion. I suspect that WoW’s subscriber numbers will rebound from Mists, at least for a little while, but it’s hard to play WoW today without feeling like the MMO market has finally started to move on around it. This year has seen the release Guild Wars 2, Star Wars: The Old Republic, and The Secret World. Of those 3 only Guild Wars 2 has had any real success, but all three of them manage to innovate on WoW’s formulae in interesting ways. The Old Republic and The Secret World both tell better stories more ably than WoW did at the time (though with Mists of Pandaria it seems like Blizzard is catching up) and Guild Wars 2 manages to do something even more impressive. It created an MMO I want to play not just with my friends, but with anyone. When I see another player out questing in WoW I’m annoyed. I’m expecting them to grab my quest items, enemies and other resources for themselves. In theory I can group up with at least some of these players, but in practice they usually steal my kills and run off before I can click on them and ask them to join. Even if I do manage to do so, they have little incentive to join me; they’ve already gotten credit for the quest and have no reason to help me. Guild Wars 2, on the other hand, rewards cooperation at every turn. Every player that contributes to a kill gets loot and experience even if they aren’t grouped together. Every player is rewarded for contributing to quest objectives even if other players contributed more. Every time another player shows up on your screen in PvE, that player can only help you. Other players are a source of anxiety in WoW. Is this person a jerk? What am I going to have to do to keep them from making my life in game worse? That’s what makes Guild Wars 2 feel truly fresh, and it took a return to WoW to understand what a huge change in the MMO market it is. WoW forces you to cooperate, Guild Wars 2 actually encourages it. Of course Guild Wars 2 has its own problems. Their dungeons aren’t as well designed and the learning curve, especially for players who aren’t used to MMOs, can be punishing. 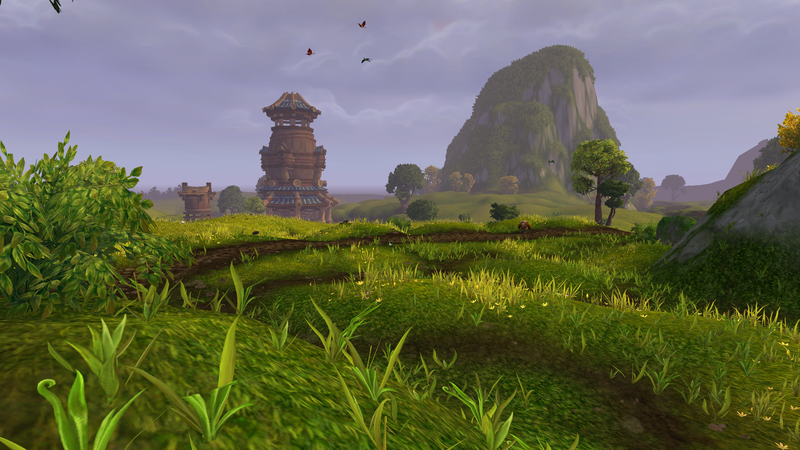 Nobody has yet created an MMO that’s as consistent and polished as WoW. There is still no “WoW killer” and even if Mists of Pandaria were a terrible failure, WoW’s most likely cause of death is still just old age. But there’s finally a sense that the MMO world is doing more than just playing catch up with Blizzard.